Lira and I hear many stories about amazing animals when we visit patients. I thought it was time to pay tribute to some of them. 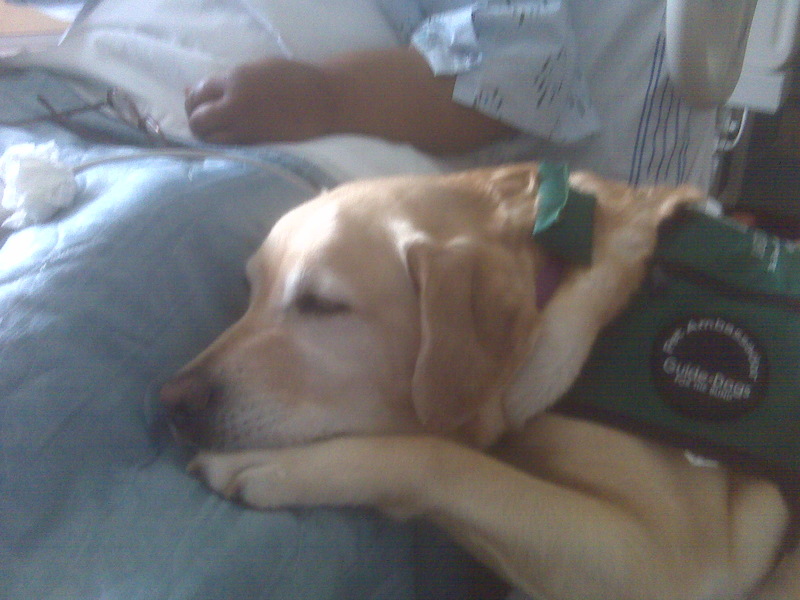 A very nice woman lying in her hospital bed petting Lira told me that she and her husband rescued a snoodle dog. They were calling the female dog Sherlock because of the whole we found you she found us scenario. They were debating for a couple of months whether to change her name because a few people had commented that it was a strange name for a female. Well one day a woman was playing with her dog in a vacant lot nearby and Sherlock was playing with them. She happened to be a dog psychologist. She came over and knocked on the door telling the couple that she couldn’t leave because the dog insisted that she come over and tell them two things. One was that Sherlock was very happy with them and two don’t change my name. Now I have never been a big believer in dog psychologists and asked if Sherlock had a tag on. She said that she did but that it only named her address. Needless to say they did not change her name. Another woman told me that she helped a black lab mix as a child. The dog didn’t belong to anybody but ever since she helped that dog he would meet her everyday ½ way home from school and insisted on carrying her books for her in his mouth. Everyday! Then there was the local nursing home cat that lives in the facility. He always seems to know when it’s time for someone to pass on. He comes and lies on the person’s chest to just be with them until they go. Then there is the story of Dixie who was at the time approximately a 4 year old Dalmatian that got dumped by the side of the Puyallup River with 10 pups. (Kudos to the Puyallup Rescue Facility that saved them) The dog really took to her husband. One night her husband had fallen asleep in the recliner. Dixie came up to her bed and insisted that she come downstairs. It turns out that her husband was unresponsive and had a massive stroke. Dixie coming to get her saved her husband’s life. My own personal story. I had a dog named Rascal many years ago. He was an all black lab shepherd mix. I always teased my son at the time that Rascal had been around since way before him. When Skyler was born Rascal took on the role of protecting him. He was one of those dogs that couldn’t be contained but was never very far from you. He lived to the ripe old age of 16. I loved him very much. One day my husband called and said that Rascal was having a very hard time and seemed embarrassed about it. For awhile now I had dreaded this day was coming. He hated going to the vet so I told my husband that I would call the vet to come out to the farm to put him down. I remember driving home that morning after a 24 hour shift at the fire station remembering all the wonderful times I had with Rascal. How thankful I was for his companionship, protection and loyalty. What would days be like without him by my side? It was going to be so hard to be by HIS side when it was time but I would be there to tell him over and over what a good boy he was. I had mentioned to my husband where I wanted to bury him. While I was driving home he went out to weed eat the area and Rascal drug himself out there and died. It was his last gift to me. And of course there is Lira. How does she know which patients need special attention, which patients want a kiss on the lips, a snuggle in the neck, their hand held or a paw on the arm, which patients are in pain and to be careful of those sensitive areas, which patients love dogs and the ones that don’t and how does she get those non dog lovers to love her, which patients need her rapt attention or a snooze with them on their hospital bed, how does she gets patients to respond when they have been unresponsive, how does she know when someone is about to pass on and how does she seem to remember every single person she has ever met. These are just a few of the wonderful stories that Lira and I experience. I know you all have your special story. Please feel free to share.